Little Jacob Michael — all six pounds, 11ounces and 20 ¼ inches of him — didn’t know his birth would be a milestone. His parents, Jim and Lisa Classen of Humphrey just wondered when he would arrive. 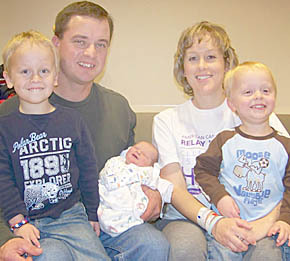 On Nov. 10 at 7:15 p.m. baby Jacob became the 100th baby born at Boone County Health Center in Albion. His birth set a record of over 100 babies born at the hospital for the second year in a row. Details in the Nov. 17 Albion News Print and Electronic Editions.